Hello Tatertots and Jello readers! It’s Laurie here from Gallamore West. I’m in love with all things Christmas, especially all of the fun Christmas treats to eat, so I’m excited to be here with you today to share something delicious and different. I love the combination of salty and sweet. Drizzle on some chocolate and sprinkle on some crushed peppermint and you’ve got a little bit of salty sweet heaven in these Chocolate and Peppermint Drizzled Potato Chips! 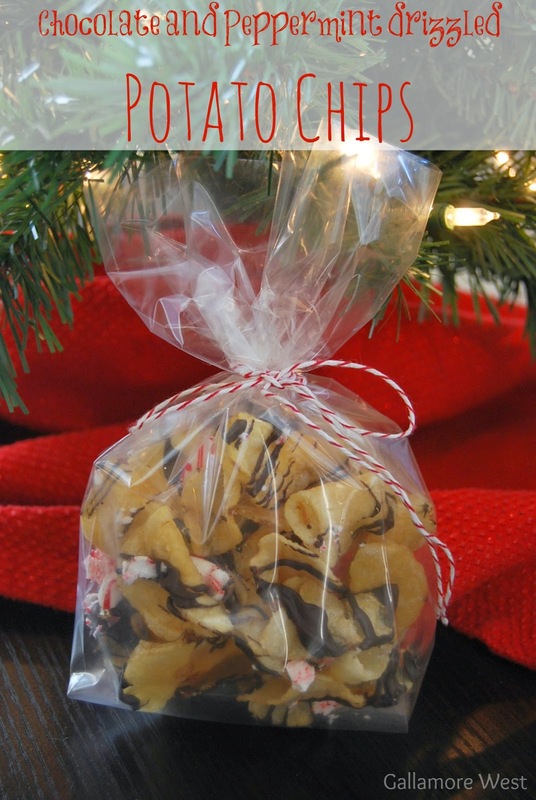 These Chocolate Drizzled Potato Chips with Peppermint are so fun to make and give as gifts because it’s easy to make, but different than what people are used to getting at the holidays. It makes a deliciously memorable gift for your friends and neighbors. Directions: Spread the potato chips out on a parchment paper lined cookie sheet. 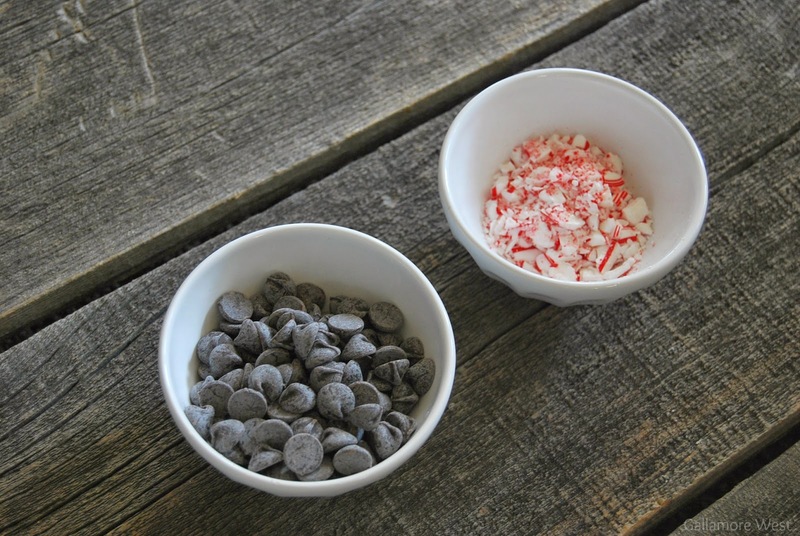 Drizzle the melted chocolate over the top, then sprinkle with crushed peppermint candy canes. Refrigerate for 20 minutes, or until the chocolate is hardened. She has a great idea for How to Host Your Best Ever Graham Cracker House Decorating Party! This would be so fun for a Christmas party for the kids! And, her Gingerbread Cookie Ornaments are another great kid craft idea! And her Chocolate Fudge Peppermint Rudolph Cookies are too cute! Laurie is so awesome and I’m so glad to have her in my Happy Holidays series today. I love the combination of salty and sweet. Drizzle on some chocolate and sprinkle on some crushed peppermint and you’ve got a little bit of salty sweet heaven in these Chocolate and Peppermint Drizzled Potato Chips! Spread the potato chips out on a parchment paper lined cookie sheet. 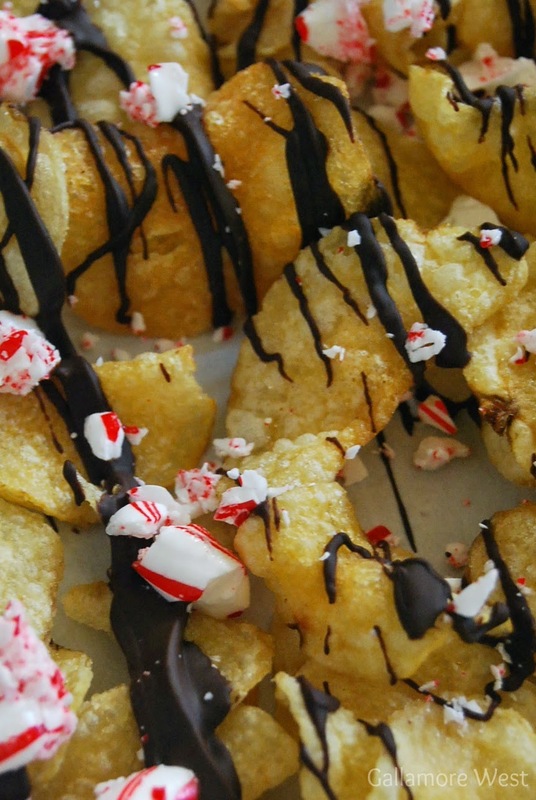 Drizzle the melted chocolate over the top, then sprinkle with crushed peppermint candy canes. Refrigerate for 20 minutes, or until the chocolate is hardened. The peppermint and chocolate drizzled chips look so great!! Will be creating this recipe this holiday season. Thanks for the blog share!! !